Does somebody know if a plugin is available for JPG outputs with metadata from Illustrator? If this can be done that would be great for managing files, since for JPGs with metadata a lot of tools are available. And also would be great to save for web from Illustrator. To answer Grant’s question (a year late, sorry! ), I want to put metadata in my illustrator files, because a bunch of our Illustrator docs get saved as PDFs, and then those PDFs get put on the web. The metadata can then get crawled by Google, etc. You may ask “well, why don’t you just add the metadata to the doc in Acrobat”? Reason being, Illustrator gives us more design flexibility. If we couldn’t store the metadata in AI docs, we’d have to make our creative changes in AI, THEN save it as a PDF, and THEN add all the metatags AGAIN. We’d have to do that every time we want to make a creative change. What if you send your .ai file to someone and then they edit author and copyright information to make it look like it´s their own? Can they do that? If Yes, there really would not be any point in doing it from a protection perspective since it can get over written! I was wondering if it is possible to place parts of the meta data on the art-board? So it will be visual, and changes when the metadata changes. And now we are talking automatic placing information on the art-board. I am looking to place the file name onto the art-board. It should change if the name changes. If you know a solution, please tell me. It is just a layer of protection for your files. If you distribute files online or work multiple people it comes in handy. From a designers perspective if you are working on a project and get a couple of eps and illustrator files, it is easy to contact the original illustrator if you have questions. The artwork you get from a client always seem to be two or three times removed from the original artist, and trying to go back the chain through the client isn’t always the more productive task. 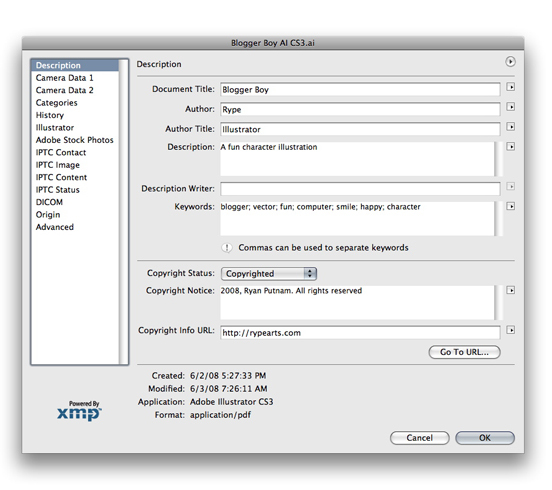 From a Illustrator perspective, you safe guard you files somewhat from copyright infringement. This won’t always help someone that is determined to take your work, but it is a start. This may be a dumb question, but what is the purpose of adding metadata to illustrator files? Who would use this option?